My quest to find the perfect fitting pair of pants continues, but work-related drama has been consuming my time and energy. So apologies for the slowdown here on the blog, and I hope this is only a temporary state of affairs. I thought this round of alterations was going to take me very close to something ideal, or at least something I would move to a test pair with. Instead, I was very disappointed with the changes I’ve made and I feel like I’ve taken some steps backwards. But first, let’s go over what I did to the pattern after Muslin D, before we talk about what didn’t work out. 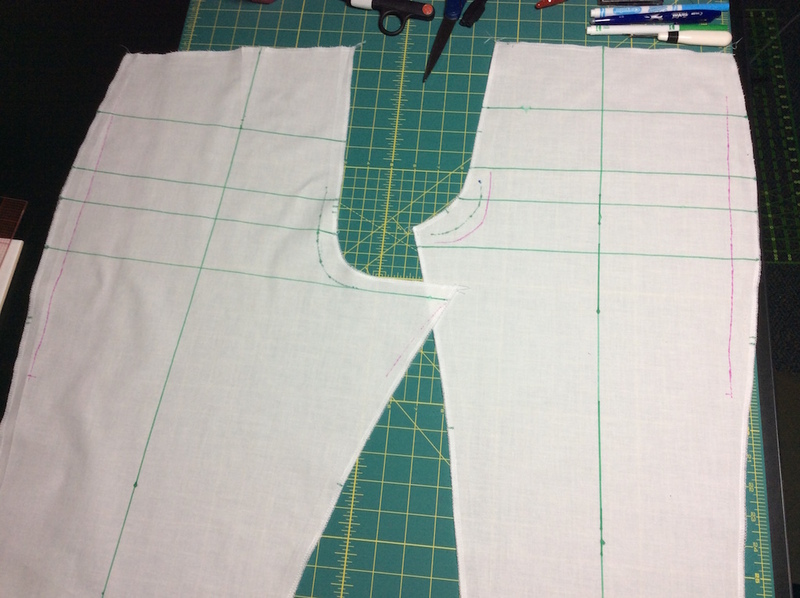 Here’s Muslin D deconstructed, pressed, and laid out on my work table. The front piece (to the right) has two different front crotch curves I experimented with, and the back piece has a back crotch curve that has been scooped a little bit more. You can also just see see the purple markings where I added to the back crotch by letting out at the inseam. The side seams are also marked where I pinned out excess curvature at the hip. This entry was posted in Pattern Fitting, Trousers and tagged vogue-8940 on June 7, 2015 by mportuesisf.